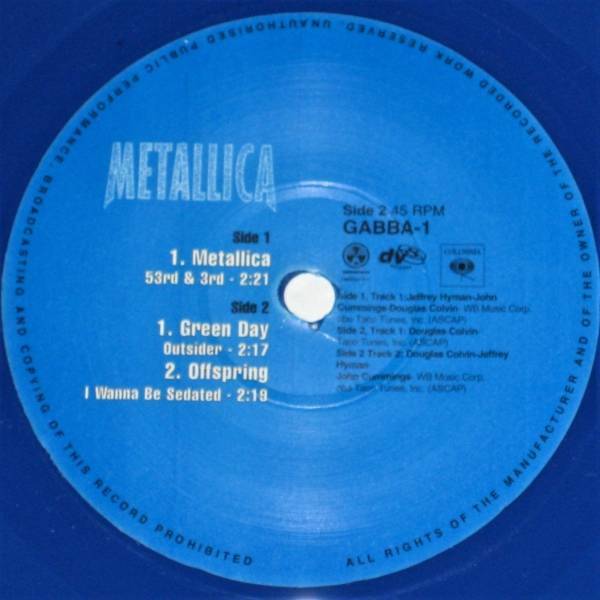 Metallica - 53rd & 3rd / Green Day - Outsider / Offspring - I Wanna Be Sedated. DV8 / Columbia GABBA-1. Rare 2003 UK withdrawn 7" picture sleeve single on blue vinyl 45. Management had this release withdrawn. Impossible to find. UK SD £8.00 (required on high priced items), First class recorded £2.70, First class £1.50. EU-Europe registered insured £12.00, Registered £9.25, Air mail £4.25. USA-Worldwide registered insured £13.10, Registered £10.35, Air mail £5.35. Australia-NZ registered insured £13.75, Registered £10.95, Air mail £5.75.